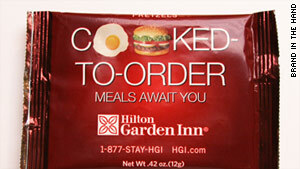 Hilton Garden Inn uses ad space on airline snack bags. (CNN) -- "You are now free to advertise about the cabin." It started with elevator commercials and "Interactive Urinal Communicators." Now the battle for brandable spaces is reaching new heights -- 35,000 feet to be exact. Brand in the Hand, a California-based company, offers third-party advertisers the opportunity to repurpose snack bags, beverage cups, cocktail napkins and other on board consumables into promotional vehicles. The benefits of a captive audience have not escaped the company's clients. "The in-flight consumer has always been very receptive to advertising," said Darrin Sarto, Director of Brand in the Hand. With roughly 600 million travelers flying in the United States in 2009, Sarto said, the concept was such an obvious publicity medium -- "a hand-delivered billboard every time." "Having that snack is a very positive part of the flight. You had to go through security, lug your baggage around, get seated and all of the sudden, the flight attendants are handing you a free bag of peanuts. And, oh, there's a message to read," Sarto said. From airport security bins to gas station pumps, the concept of advertising on previously unmarketable areas is a growing trend in recent years, said Andrew Hampp of Advertising Age. New York's Metropolitan Transit Authority allows advertisers to sponsor subway turnstiles, the back of MetroCards and entire subway cars. "The challenge for Brand In Hand and any company or marketer entering ambient media is to make sure their brand message is adding value to the consumer," Hampp said. "Anything that's deemed overly commercial or invasive to someone's everyday experience will be called out and potentially boycotted." This month, Hilton Garden Inn initiated a campaign on board Delta flights advertising its "Cook-to-Order" meals on peanut and pretzel bags. "Getting our brand message in the hands of consumers at a time when they are in the act of travel and thinking about hotel choices is an ideal marketing moment for us," Jim Cone, Vice President of Marketing at Hilton Garden Inn, said in a release. It is still too early to tell if the promotion was a success, according to Sarto. Brand in the Hand is a division of Harvey Alpert & Co. -- a provider of snack foods and beverages to major carriers such as AirTran, Alaska, American, Continental, Delta, Southwest and United Airlines.